Whilst not a pure Business Class experience, you do get many of the perks that might make the new Singapore Airlines Premium Economy a cheaper option to ride like a boss without sacrificing too much comfort. If you live in Singapore it’s hard to escape the fact that the flag carrier has recently launched a new premium economy class across their fleet of A380’s B777 aircraft. MRT stations, TV stations, Facebook ads and outdoor billboards have all been flooded with advertisements promoting this new class generating lots of buzz and excitement. So why the big song and dance? We’ll SIA believe they are bringing something big, bright and new to the table, having watched other airlines introduce their premium economy classes earlier, they have had time to learn from their mistakes and introduce a superior product. Arriving at Sydney Airport 2.5 hours before departure I found the SIA counter almost queue free. Not that if there was a long queue it would have have mattered as Singapore Airlines Premium Economy has its own check-in counter which was empty as I arrived. Service from the ground staff was attentive, friendly and within 2 minutes of arriving at the airport my suitcase was checked in (with priority tag) on its way to the plane and I was on my way to the gate. A bonus with Singapore Airlines Premium Economy when departing Sydney is getting an Express Pass. This lets you skip the line at customs and security. If you are familiar with Sydney airport you will know this is a huge benefit as the process can take up to 40 min in the slow lanes with everyone else. This gives plenty of time for chill and relax before the flight. For me this time was catching up on work and a quick pint to use the last of my AUDs. This is the one major part where the experience is lacking compared to Business Class – No lounge access! However the Singapore Airlines usually departs down from gate 60, a modern and spacious part of the airport with comfy couches and plenty of food choices. So I really did not feel like I was missing out too much. Boarding is also a breeze with a designated Premium Economy queue there is no waiting at all, and you do feel someone privileged to walk past the 50m long Economy queue of over 300 passengers on an A380. On-board, the seats are smartly designed and made from soft leather that still had that “new car smell” that signalled they had just been installed. Seats have a generous 38 inch pitch (6 more than standard economy) allowing for a deep recline angle and also have an extendable footrest. When both are extended you almost feel like you are lying with your body fully extended, just at a 45 deg angle. The bottom half the seat is smartly designed as to limit the intrusion on to the passenger behind you. There’s 2 USB ports per a seat (one of which is strong enough to charge a tablet) and a power socket to keep your gadgets charged. You also have an overhead light and a small flash-light on a flexible arm should you want to read in the dark with your light at the perfect shadowless angle. Space is the order of the day. The cabin is set up in a 2-4-2 formation. Should the person in front of you fully recline there is nothing to stress about, as there’s still space to use a laptop and the seat won’t come close to hitting your knees (Unless you’re 7ft 7). 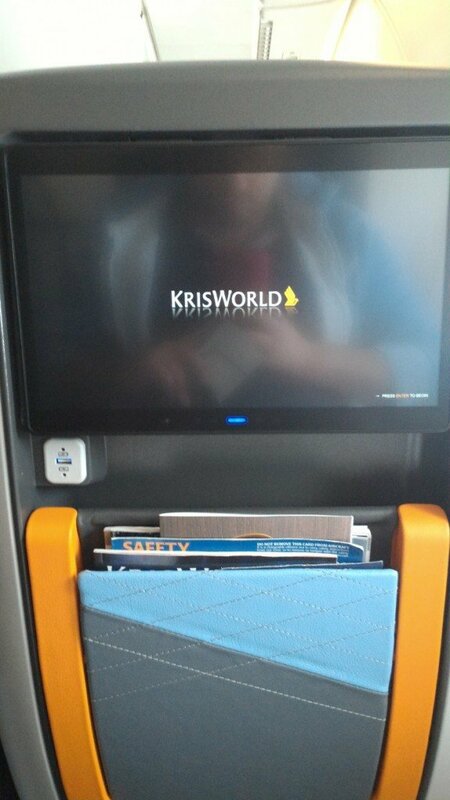 Entertainment comes to you from a full HD 13.3 inch monitor to control Singapore Airline’s legendary KrisWorld in-flight entertainment system. Movie and TV selection was as recent as what you would find on Netflix with some older classics thrown in as well (All 3 Back to the Futures for example). If there is a let down here, it’s that although the screen is HD, movies and TV shows are presented in SD and high compression rates sees some pixilation in fast moving action scenes. It also is not a touch screen so you control via the retractable wired remote. WiFi or internal 4g (via an on-board base station) is also available depending on which system has been installed on your aircraft. 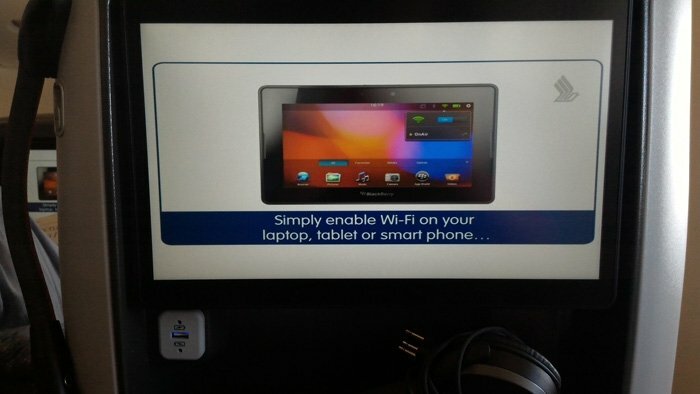 Connect to in-flight WiFi. Even if you were the only person in the world that bought a Blackberry Playbook. French champagne, nuts and the Entourage movie. Let’s get this flight started. You will not go thirsty or hungry when flying Singapore Airlines Premium Economy. With drinks served just after take-off, again before dinner and 3 times during the dinner service. Champagne was the suggested drink of choice by the crew, and who am I to disagree. It was great to enjoy a couple of glasses before dinner, however I feel if they offered it before take-off it would’ve been extra special. Meal time. What is different to economy? The Premium Economy cabin did not appear to have its designated cabin staff. 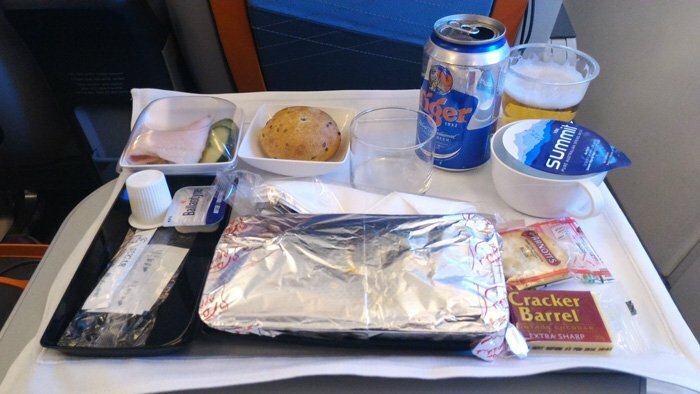 However they were ever present in the Premium Economy cabin much more than in Economy, so you are well attended too and meals are served fast and also retrieved fast – you won’t be sitting around with used dishes in front of you for an hour as can be the case in some economy classes. Despite having your own cabin you will need to venture into economy to use the loos. If there is a fault on my trip, I was sitting in the last row of Premium Economy, I must have just out of vision when the crew entered the cabin as twice my empty cup was not removed while the rest of the cabin’s was (First world problems, I know). Food wise there’s 3 choices for each meal and we are talking a step above economy mush. You will also get enjoy eating with real knife and forks and wine in an actual glass made of glass too. The cabin just after the lights fade on before landing. Seating configuration is 2 – 4 – 2. 2 less seats per a row than Economy. 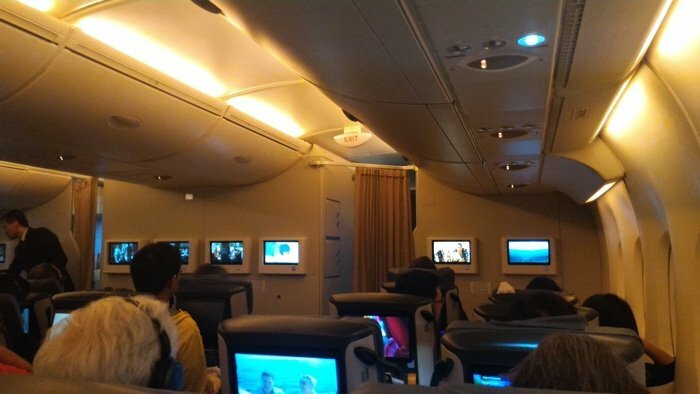 So is Singapore Airlines Premium Economy worth the extra money? If you are departing out of a busy and not so organised airport like Sydney then the bonuses of designated lines and the Express Pass make the airport experience a whole lot more enjoyable and relaxing. 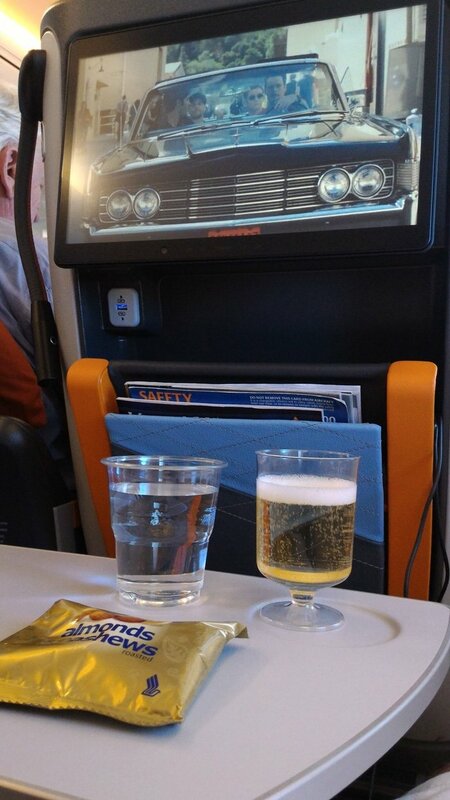 Also if you want to drink champagne all the way to your destination, and have a quasi-luxury experience without needing to take out a bank loan for a business class flight then Singapore Airlines Premium Economy is a great choice. The experience really is a premium one and goes beyond a slightly bigger seat that you will experience on other airlines’ premium service. If you are doing an Australia to UK flight or on an overnight flight, the investment in extra comfort will be worth it so long as you have the cash to spare. 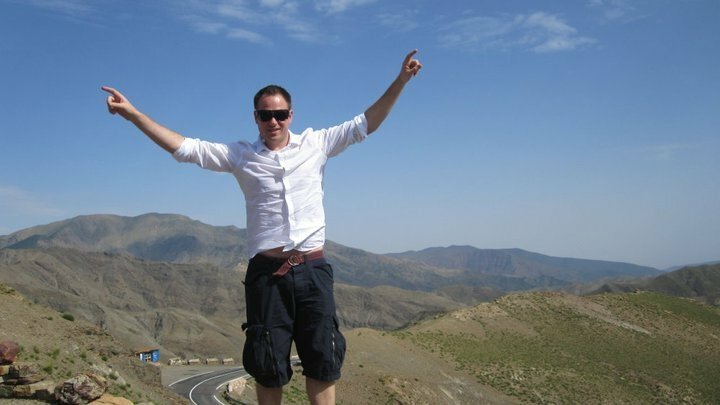 This entry was posted in Asia, Oceania, Travel and tagged flight review, premium economy, singapore airlines, travel. Bookmark the permalink.